Technically three t-shirts, as I couldn't resist picking up one of the Mega Man shirts, designed by artist Michael Myers Jr., for the mother of my children. You might have seen Michael's work right here a few hours ago. This looks like a Mega Man take on the Mario's Closet piece that circulated a few years back, only cooler because a robot boy is involved. It's available today and today only at TeeFury. 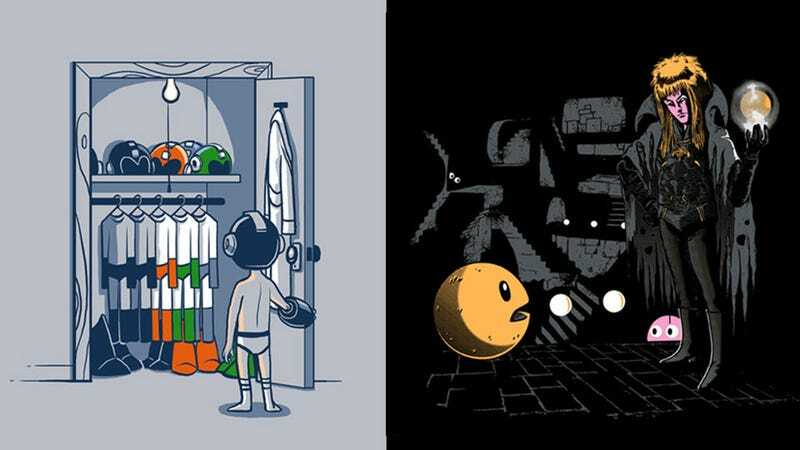 Meanwhile at Ript, artist Riccardo Bucchioni places Pac-Man in the strangest maze he's ever seen, complete with David Bowie as the creepy guy with the massive package. It's almost better than a t-shirt that's just a close-up of Jareth the Goblin King's crotch. Almost. Grab a t-shirt, hoodie, or onesie featuring Riccardo's glorious design today at Ript or lose it forever.